I was always a makeup maniac but off late I have become an addict. Even if I am staying at home with no one visiting, I indulge in makeup and do some simple looks. Before, I did not care about makeup when stepping out of house but now I always make sure I have a proper base, a tint on lips and some light drama on eyes. 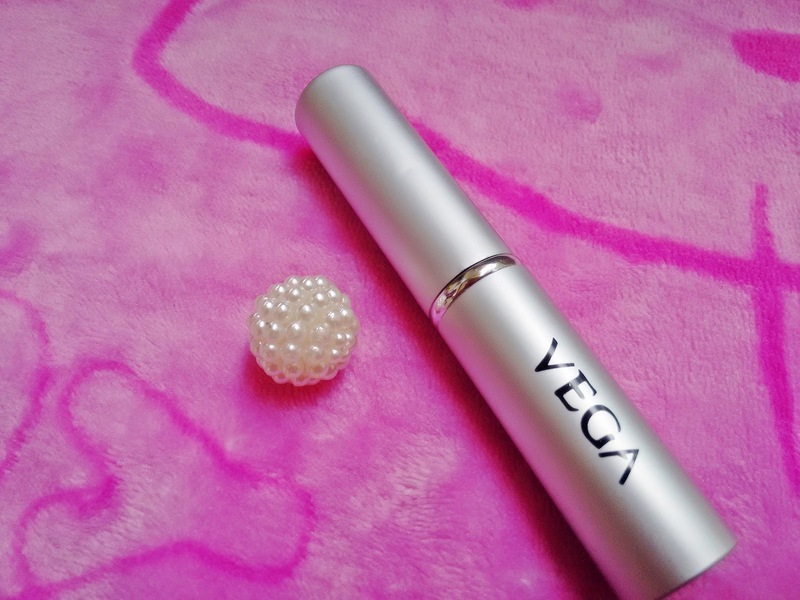 Recently I attended my friends wedding and ended up carrying all my full sized brushes there to do touch ups. 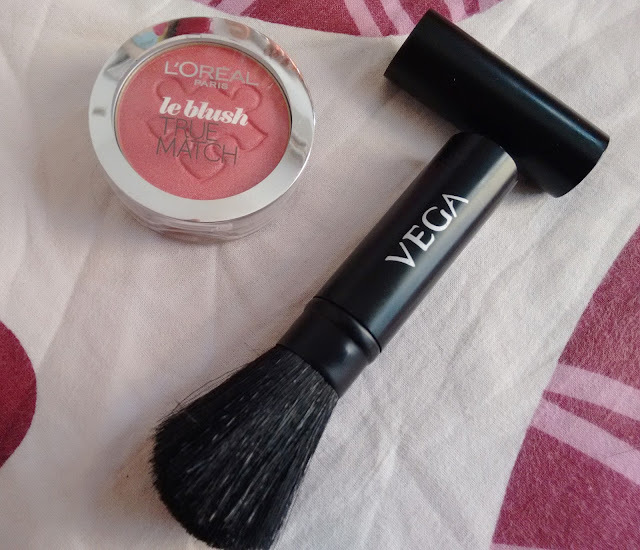 Travel sized dual ended brushes which come with eye shadows and sponge with compact comes handy when away from home but for applying blush, I need a good blusher brush always. So, I decided to invest in a travel size blush brush . On amazon, I found this Vega brush which was priced like pea nuts, looked cute and was retractable. Could I resist? NOPES! 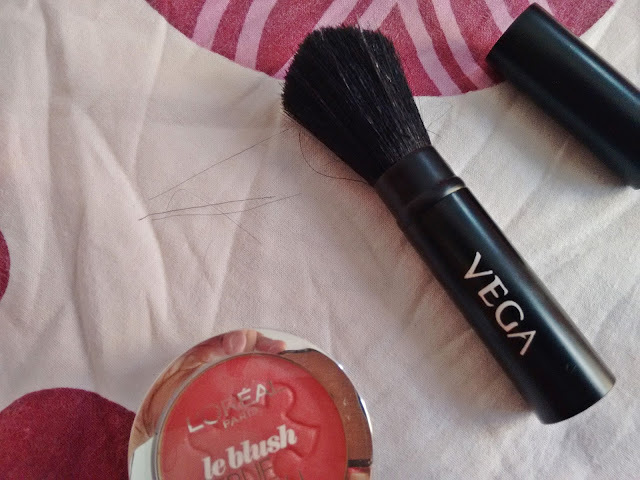 When the blush brush arrived, I opened with joy. 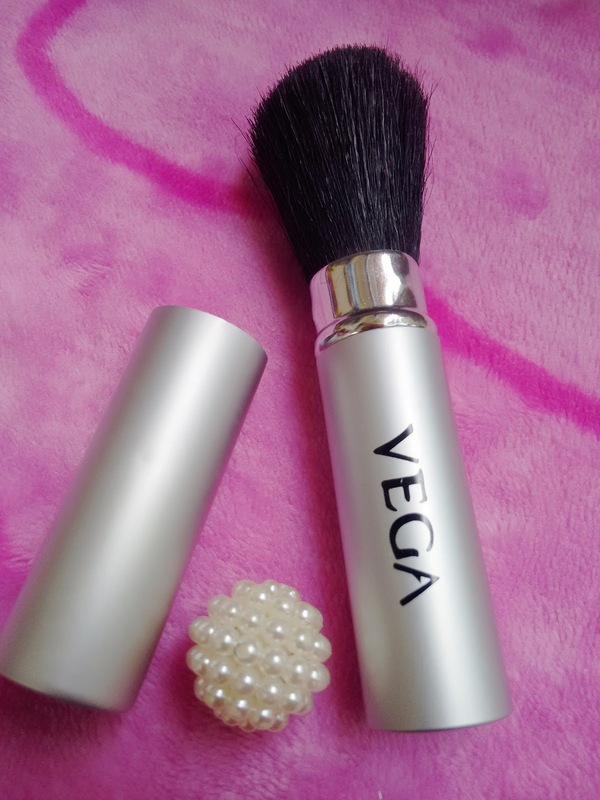 Vega Retractable Blush Brush looked classy especially the silver version, it opened easily and shut nicely making it ideal for travelling and parties. 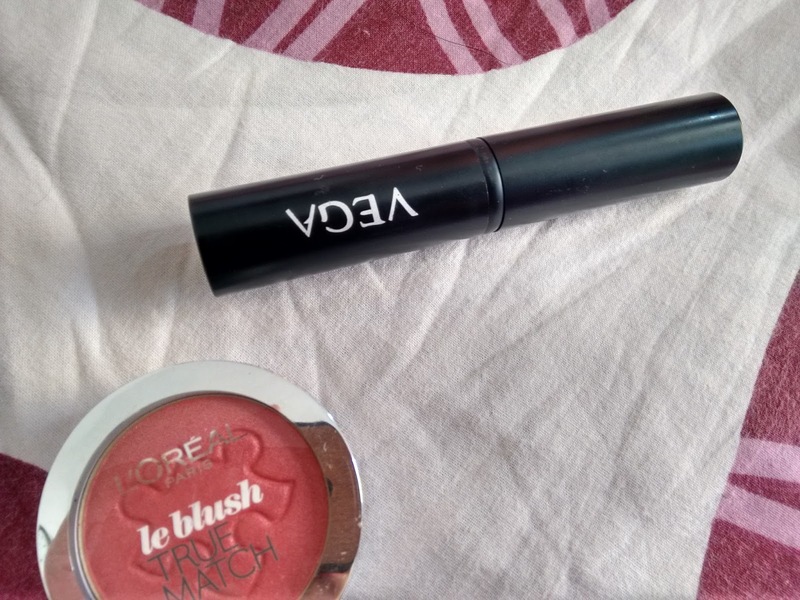 It was compact and could even fit in my smallest clutches, the bristles were black and dense and that is all that is good about this blush brush. The dark black bristles poked my cheeks, they are super scratchy. It doesnt even pick the right amount of product forget applying and blending blush on my cheeks. The bristles of the brush arent strong at all, I found them coming off with every application and I havent washed it even once yet! I cant figure out what to do with this blush brush. 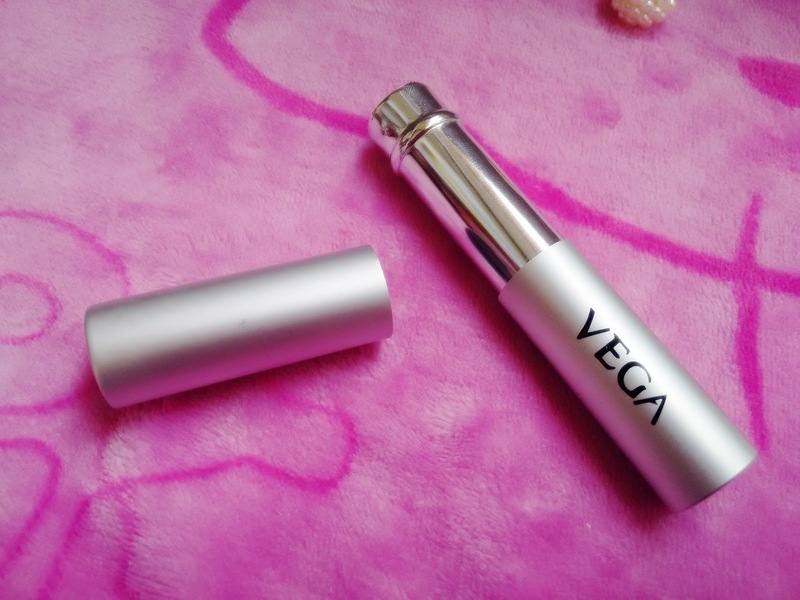 I tried using it as a powder brush but the pricking is there and product wastage also. I am now considering giving it to my kid to paint with it but this isnt ideal for painting too as the bristles will come off faster!! 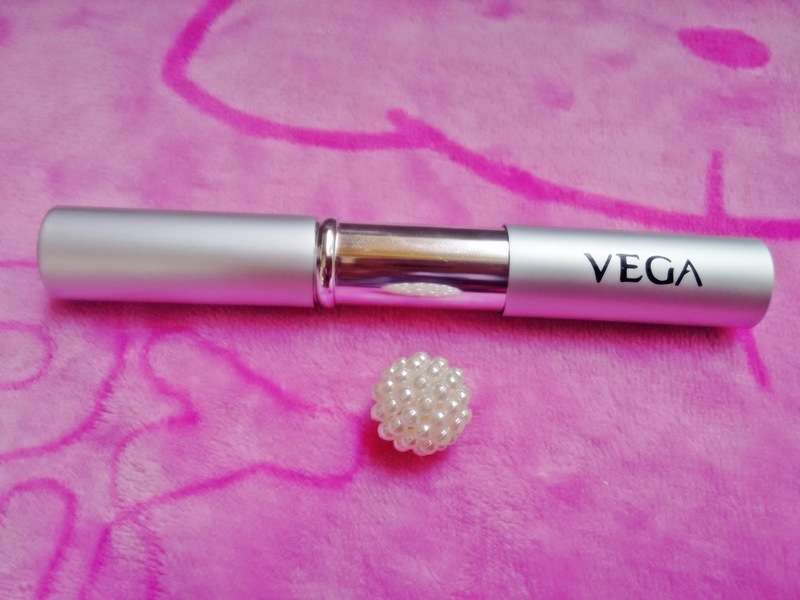 Overall the Vega Retractable Blush Brush is a disater brush packaged very beautifully. I wouldnt recommend this to anyone. I have now decided to up my makeup game and brought a Real Techniques travel trio brush set which has the most soft and smooth blush brush. 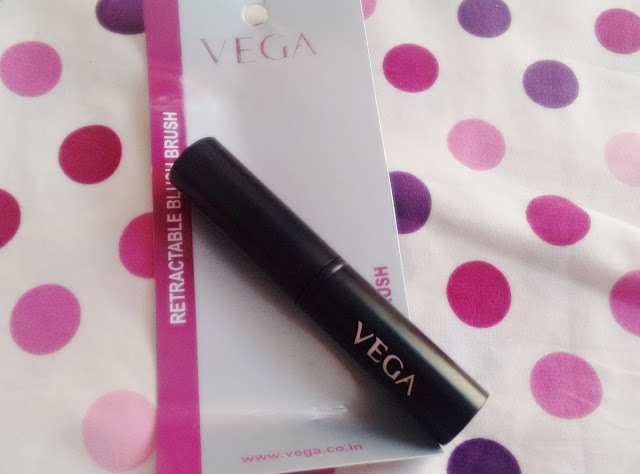 Have you tried this Vega Retractable Blush Brush? Which brush do you travel with?Tell us !